Crystal Acoustics unveils its £60 WiDAC wi-fi audio receiver | What Hi-Fi? Hi-fi manufacturer Crystal Acoustics has launched the latest version of its audio receiver system, the wi-fi WiDAC. The receiver will be available shortly for £60. The built-in wi-fi system allows users to stream music wirelessly from a smartphone, tablet or computer to their existing audio or home cinema setup. The unit doesn't require you to have a home network in order to stream. Unlike its Bluetooth sibling, which requires the connected device to be within a few metres of it in order to stream consistently, the built-in wi-fi system has a range of up to 100m. 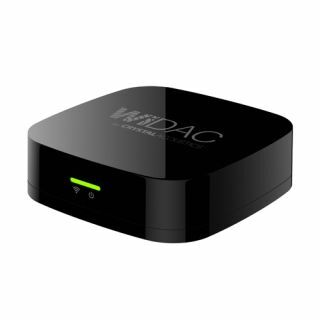 With AirPlay and DLNA functionality, the WiDAC receiver is compatible with iOS, Android DLNA and Windows so will support a wide range of devices. The compact box supports a USB power supply and an optical digital output "for best-possible signal transmission". It's also equipped with a high-quality Wolfson DAC, and for those with a dedicated outboard DAC or high-end amplifier, the WiDAC it can be hooked up using an optical digital output.